Father Anthony has reached his ideal - the Priesthood! My dear brothers, be glad that your brother is a priest. The spiritual education of the youth was his supreme joy. His name was revered and recommended to other souls by penitents who admired his prudence. Even the highest ranks of aristocracy and intelligentia came to him with confidence. Anthony prepared himself with great fervor for the dignity of a minister of God, making a spiritual Retreat in the House of Redemptorists in Avellino. On the fourteenth of December 1930 in the Church of St. Nicholas of Monteforte Irpino he was ordained by Bishop Petronelli, Bishop of Avellino. More than a day of rejoicing it seemed to be the day for the offering of a victim. The ceremony was simple and edifying. Lived under the sign of the holy Cross, that day of joy for all, was for Anthony filled with mortification and intimate pain. 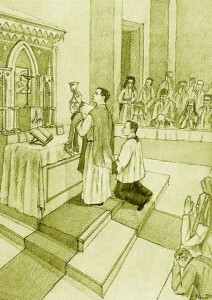 His second Mass he celebrated at the Cemetary in suffrage for the souls of his father and mother. On that occasion also the members of his beloved Congregation, though not present in person, were present spiritually with him. The Vicar General sent him a letter full of good wishes and rejoicing for his Ordination. Though at home, the servant of God felt the sincere and loving voices of his former Superiors and confreres. Writing to his brothers in America, he showed the fullness of his joy by asking them to “rejoice that you have a brother who is a priest”. After the Ordination Anthony requested from the Superior General, Reverend Fr. Lorenzo Phillipe, the permission to spend some days among his former companions in the Congregation. The request was very freely granted and he was able to pass some fifteen days in the company of the religious. Having returned to his native town, he felt again the longing for the religious life. Acceding to his request to his Bishop in Avellino and to the Superior General of the Congregation, he was allowed to transfer to Rome and was attached to the Church of Christ the King (Chiesa di Cristo Re), with the hope that with the peace and quiet of the religious house and absolute rest, his strength might return. Now begins the most dynamic period of the life of Anthony. In it shines forth a new spiritual gift- his zeal for souls. For three years he dedicated all the energies of his young life to the ministry of the Church of Christ the King, in Via Mazzini in Rome. With great constancy and courage he conquered and overcame the physical handicap of his illness. We get the impression that the sacrament of Holy Orders had operated within him and a transformation and a new invigoration of his feeble strength: the work of God which aids those of good will ready to sacrifice themselves for the good of souls. 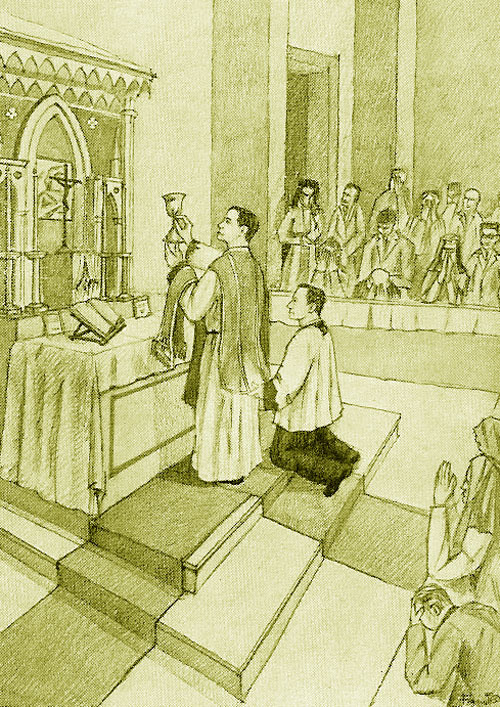 Given charge of the Sacristy, he was zealous in the affairs of the Parish to a heroic degree, remaining at his work a great part of the day, lavishing help and advice and good counsel with kind and gentle words and with great delicacy. Calm and possessed and smiling, he listened to everyone, had a kind word for everybody, and was never seen to lose his composure. He joyously took his share in all the functions of the Church and in his short time there he had baptised very many new-born children. He was active and untiring in the Confessional until the last day of his illness. One of the priests of the parish, in answer to the question of some of the young people of the parish, had this to say: “Father Anthony was a saintly priest, an expert and gifted confessor, a wonderful organiser, a hidden hero, a very amiable, tender, indulgent and most generous pastor of many souls”. His generosity manifested itself on many occasions when he knocked at the doors of the poor, bringing that material help which is so often the foundation of supernatural help. He said various times: “ I hope to understand their souls so as able to give them my help in the best possible way, because it seems that paradise is attained by administering material good to the neighbor and, with this material good and over and above it, spiritual good”. He said so many times that the spiritual education of young people was to him a great joy. 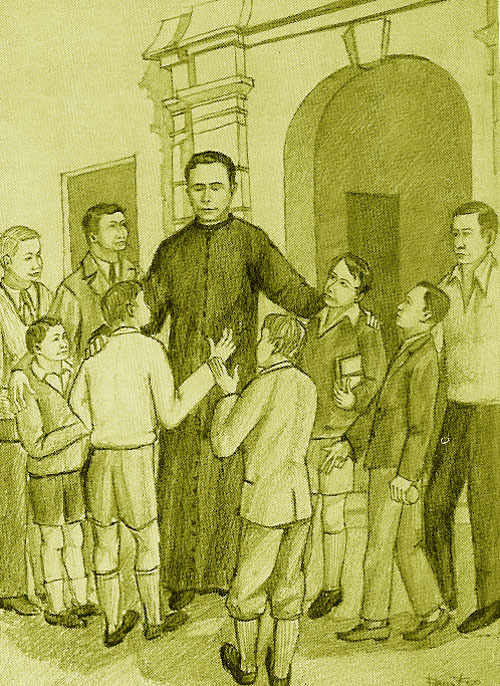 In fact the apostolate among the young constituted the ideal atmosphere for his priestly zeal. To this he gave himself with great fervor and simplicity. Charged by his Superiors with the organization and instruction of the altar boys he made this the principal care of his parish work. He was constantly with them, counseling and encouraging his young friends with a smile, and was always for them an inimitable master, kind and patient. He instructed his young charges in the practice of sacred music, seeing in sacred music an act of faith and love for God and a powerful aid in the training of the children. This was a new and refreshing source of parish life introduced by Father Anthony: the singing of the children. He was a father to them who knew how to guide them with an expert hand, how to guide their young souls and how to sow in them the good seed that would in time bring forth good results. 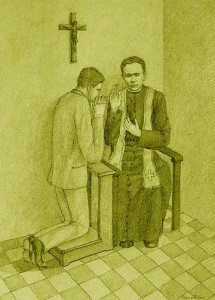 Having obtained his faculties for Confession he gave himself to this work with such zeal and assiduity that it became in a short time the preferred ministry for him. There was at first a small group of penitents, but soon word of his zeal, his goodness and his skill circulated in the parish, and very many used come to his confessional. His name was venerated and he was highly recommended by his penitents because of his great prudence. Even those of high station socially or of esteemed learning came to him with great confidence. Many stated that he seemed to understand truly the state of their soul, that he almost had a gift of being able to scrutinize the human heart, that he had the power of inflaming the tepid and of converting hardened sinners. Above all when he spoke of pain and suffering in this life his words were most efficacious as he seemed to speak from his own personal experience, and to infuse in suffering souls sentiments of peace and happiness. Most devoted to the Sacred Heart of our Lord, he propagated the devotion at every possible opportunity and in every possible place. In a special manner it was his wish to see every family in the parish consecrated to the Sacred Heart. Prudently but tenaciously he inculcated this practice among his penitents, and when any family wished to make such a consecration he visited the family, blessed the picture or the statue of the Sacred Heart with a few appropriate words and then with intense devotion he read the Act of Consecration, happy in the thought that one more family was irrevocably consecrated to the Divine Heart.